SUMMARY: When inspiration hits in the last hour, it may seem like the most logical thing to do is to push the idea to the side. However, this lack of flexibility may be hurting you more than you think. Being flexible when your sending calendar is already set can lead to amazing results. When a member of the Ebates team received a holiday preview email that inspired him, the team went to work, putting their own creative approach on a send that became customer-focused, not sales-focused. Learn how this email, which was created in two days, won multiple awards. Ebates is best described as a shopping portal. The website works to help Ebates' members save money on their purchases by connecting them to more than 1,800 merchant partners. Members start their online shopping trip on the Ebates site before clicking through to a merchant's site. Ebates then tracks that member's shopping session and rewards members for using the service in the form of cash back. This cash back is a percentage of the purchased item's price. "Then what happens is that every quarter those purchases and that cash back is aggregated or summed up, and we send you either a big fat check in the mail or we credit your PayPal account," Derek Kazee, Director of Retention Marketing, Ebates, said. "Our CEO calls it a win-win-win," he joked. "It's a win for the customer, it's a win for our merchants and it's a win for us." Based on studies the company has performed, Ebates' typical member is a woman between the ages of 25 and 40 who is fairly affluent. The site attracts customers who may not need the Ebates' savings but like to shop smart. "Obviously, that goes up, but our core audience is in that age range," he said. "They're typically married. They typically have children, and they typically own a home. So from the research we've done, that's pretty much our core audience." 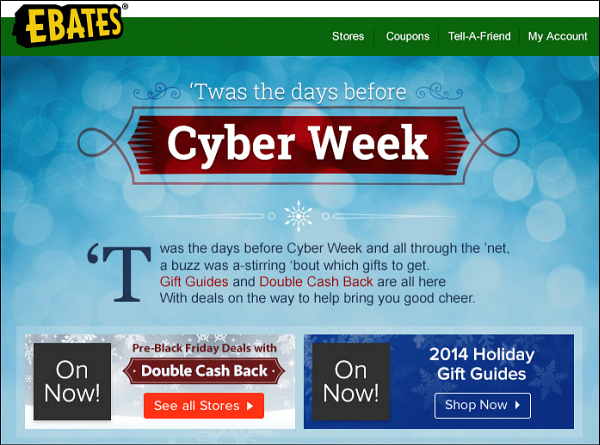 Ebates had a series of promotions scheduled for the holiday season. These promotions were designed to run from late November to mid-December, but the team had no plans of releasing the exact dates of these promotions to its members. However, a marketing send from a B2C list Kazee was subscribed to changed that. This straightforward send acted as a preview email for recipients. Kazee said it essentially read, "Hey, cyber holiday is right around the corner. 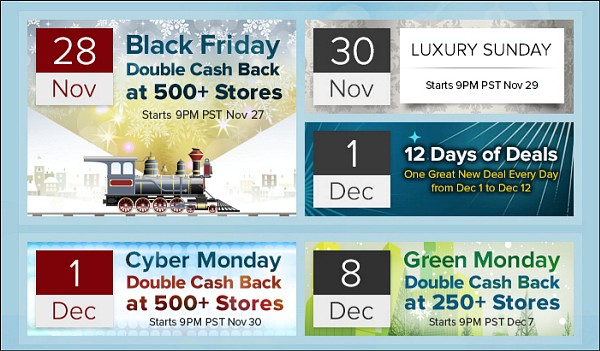 Mark your calendar for these three promotions coming up for Zappos." "I got the email, and I thought, 'You know what? We should be doing this,'" he said, thinking the team could expand on the idea in their own way. With this burst of inspiration delivered right to his inbox, Kazee and his team went to work constructing an email send that would preview Ebates’ upcoming promotions in a fun and creative way. The result: the "Twas the Days Before Cyber Week" send. This focus on creativity paired with the timeliness of the upcoming Black Friday and Cyber Monday sales days led to an overwhelmingly successful email that kept Ebates' front of mind with savvy-shopping members. This one customer-centric send has won several awards, including the Award of Excellence in the category of "Content Marketing — Email Marketing" from the Communicator Awards. Learn how this email send, which was developed and implemented in less than two days, became an award winner by focusing on informing members about upcoming promotions rather than selling to them. Perhaps the most integral part of this campaign occurred before the promotional send was ever conceived. The team spent the months before the holiday season developing promotions for this shop-intensive part of the year. It was because this schedule was in place that the team could even consider doing the promotional send in such a quick turnaround. Each of these promotions already had at least one dedicated send set on the calendar. For example, in the days before the Ebates' Thanksgiving Day sale, the team had planned on sending all members an informational email, alerting members to the promotion and the savings they could have. "We had everything planned out and lined up, but what we didn't have planned was a preview to those promotions," Kazee said. Having these promotions already in place greatly helped the team when it came to composing the "Twas the Days Before Cyber Week" send. "Each of those [promotions] has specific creative content that was already created, planned and completed," he said. "All we really had to do was to rewrite the 'Twas the Night Before Christmas' and then lay this out." Kazee and his team were preparing for the upcoming promotions when Kazee received a preview email from Zappos about its upcoming holiday promotions. This relatively straightforward and short send featured a paragraph explaining Zappos' email schedule for the upcoming promotions, as well as three bullet points announcing its Thanksgiving Day sale, Cyber Monday sale and the last date customers could order by and receive their purchase before Christmas Day. It also featured a simple call-to-action, encouraging recipients to "Shop Now." This email was sent to Kazee on November 20 — four days before Ebates' Mobile Monday promotion and during Ebates' Pre-Black Friday promotions. Even though he and his team already had a packed sending schedule, he saw this Zappos send as a source of inspiration. With this inspiration in mind and a series of tight deadlines in place, he and his team set out on creating their own holiday preview send, with the goal of being informational rather than sales focused. Kazee brainstormed with his lead copywriter, Zach Woolford, Content Marketing Manager, Ebates, about a creative approach for this preview send. Together, they decided on the "Twas the Days Before Cyber Week" theme, a play on the holiday classic, "Twas the Night Before Christmas." "I would have to give all credit to Zach for coming up with that idea," Kazee said. "I challenged him to create a concept for a preview email that was better than Zappos, and he hit not only a home run but a grand slam." The night after the Zappos send, Woolford took it upon himself to rewrite "Twas the Night Before Christmas," incorporating references to the 10 major promotions the send was previewing. This copy was intentionally structured to be informational rather than sales heavy. "This was not a sell commerce heavy call-to-action campaign. It was more for informing or helping our audience plan their shopping over the holidays," Kazee said. After this creative email copy was prepared, it was sent over to design. With the promotions chosen and the copy in place, the content was sent over Erin Dang, User Experience and Interface Designer, Ebates. Typically, designers would have a week to develop the creative for a send like this, but because of the approaching deadlines of the brand's holiday promotions, Dang did not have the luxury of time. For each of the upcoming holiday promotions, creative elements had already been planned out and approved. Dang utilized these approved pieces into the preview email's design, highlighting the dates and deals of the 10 current and upcoming promotions. These large creative blocks paired with the send's long copy made for a long, scrolling email that, Kazee said, went against best practices. However, he and his team were comfortable with this because they believed this longer send would provide a lot of value to their members. "We felt like our members would read the whole thing and engage with ... the entire piece of content," he said. According to Kazee, both Woolford and Dang hit it out of the park. "I'd say within a day or two, we had this beautifully written, uniquely designed, wonderful piece of content that became 'Twas the Night Before Cyber Week,'" he said. Within two days of the inspirational Zappos send, the Ebates team had created and designed a preview email that was ready to run on Saturday, November 22, 2014. This date was a strategic decision on the team's part. "The reason for that [send date] is because the Mobile Monday — the inaugural Mobile Monday — we did was the 24th," Kazee said. "A few days later was the first promotion, so we wanted to get it out before that." More importantly, this send engaged Ebates' members with unique content while driving awareness to its promotional calendar. According to Kazee, this helped members plan their shopping trips and had an impact on holiday revenue for the company. "I think we accomplished our goal, which was to inform our audience about all the great promotions that we had already planned out," he said. doing it in a way that was compelling to our audience. And I think we accomplished that." Looking forward to next year, Kazee said that the Ebates team plans on running the preview email again, but they plan on bettering the send. Whereas the 2014 send could only feature clickable calls-to-action for live promotions, Ebates is working with a company this year to make all of the creative elements calls-to-action. When asked what advice he would give to other email marketers looking to innovate their sends, Kazee focused on the importance of data in addition to utilizing a creative approach and being customer-centric. "My advice would be to really dig in the data, look at historical trends, know your members, know your customers, map it against what you did and look for additional opportunities to market to them ongoing," he said.